As the weather forecast for last weekend was looking really positive I made a last minute dot com decision to go on a mini cycling trip to France. I'd originally had a mega plan to do La Route des Grandes Alpes, but then thought against it for logistical reasons. But hey, riding in France doesn't always have to be about the high mountains. For all the times that I've been cycling in France I had never ridden in or to Paris. It's something I've always wanted to do, and getting there can't be that difficult once you've crossed the channel. So that's what I did last weekend. 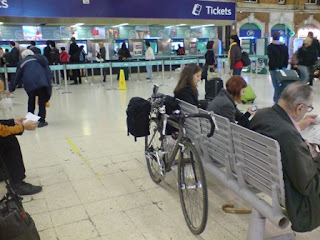 Actually, my journey started on Wednesday night when I rode my pannier laden bike from my office in Westminster and across the way to Victoria Station. I boarded the 7.47pm from Victoria to Newhaven Harbour. When I arrived there at around quarter past nine the place looked a real ghost town. Not a lot happening, no one in the streets. I could see the port, but I had to go around in circles a bit to find the ticket office. Boarding the ferry was a pretty straight forward affair. All 10 foot passengers plus 5 trucks, 2 cars 3 transits boarded the frigate. There would be no mad scramble for the best seats on the 10.30pm crossing for Dieppe ! We promptly boarded the ferry and I found a spot where I could curl up and go to sleep. Once in Dieppe, at around 4am (local time) I rode across town to my hotel. The road out of the port was cold, lonely and pretty hilly. In the darkness, I was able to adjust my eyes so visibility was not a problem. There were hardly any oncoming vehicles so there were no scary instances of getting dazzled. I took the main circular road (La Rocade) to get to the Formule 1 hotel, but I believe there was a shorter route on quieter roads. At that time of night I couldn't be bothered to try and find it though, and it wasn't as if I would be caught up in sprawling traffic at half 4 in the morning ! Once I arrived in my hotel I was relieved to get my head down and rest. The 5 mile ride into town had been pretty much uphill and I was quite tired. Hopefully I'd have a bit more energy the next day to make the 100+mile trip to Paris. I kept my bicycle in my room, which the receptionist was happy to let me do. He had suggested I leave the bike outside as it would be safe. I replied by saying I would rather not leave my bike outside all night. "But let's face it," he said, "night time has finished !" He had a point I suppose. The 1 hour time difference meant that sun rise was at almost 8am. I didn't leave the hotel until after 9 o'clock. Dieppe is an old town, with nothing special to see, but as port towns go it was quite pleasant. It was certainly a more cheerful place than Newhaven. The sun shone brightly, even if it was a little cool. The rush hour traffic could hardly be called rush hour. Traffic was light and orderly. Very soon I was on the minor departmental roads heading down towards St Saen (Normandy). There were hardly any vehicles along this road. I think I counted 6 cars along the 20 mile stretch ! The architecture was pleasant - mainly wood panelled bungalows that had windows adorned with flower beds. The terrain was very easy - flat with very gentle undulations. I didn't care to ride particularly quickly. With 9kg of panniers to move along on my heavy cyclo cross bike and my unsylph-like frame, there would be no rushing on this journey ! Anyway, my friend Rachel wouldn't be home until evening, so I had all day to get to Paris ! 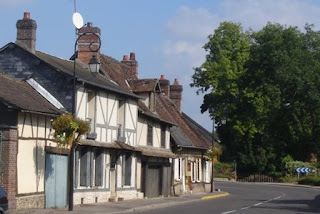 St Saen was a quaint Normandy village. When I arrived, there was alot of activity as it was market day, and all the locals were out to meet and greet each other - exchange stories about life and the universe while getting their kilo of butter. I proved to be a bit of a novelty as they could see I wasn't from round there and they seemed quite flattered that I'd stopped in their town. In fact that seemed to be a bit of a recurring theme on my trip. After a croissant aux amandes I pressed on towards Buchy, where the architecture and the terrain began to change. There were more two/three storey brick houses that had balconies and window boxes. The roads even began to climb uphill a little. But still, it was nothing that required the granny ring. 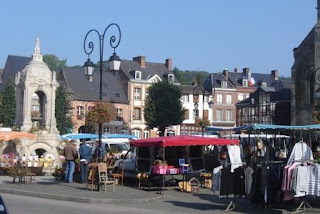 I then passed through towns that ended in Andelle - Croisy sur Andelle, Perrier sur Andelle. Things were quite scenic here. I lost a bit of time when I missed a turning for Lyons La Foret and had to go back on myself. It was a bit irritating as I ended up climbing back up the lovely descent I'd just done. Then after that the road up to Lyon La Foret was a 4 mile climb. In fact, that was the main climb of the day. The scenery around here was beautiful, and I imagine it's one of the local areas where cyclists go. There were also various trails through the forest, so probably alot of off-road stuff goes on here too. I also noted the town of Lyons La Foret to be quite a sought after place to live. It's got a very old feel to it, with some parts having preserved it's original 17th century architecture. It's that part of Normandy where the houses are decked out in period decor, some even with thatched roofs and oak beam exteriors to give it that extra historic feel - then topped up with a satellite dish on the roof ! 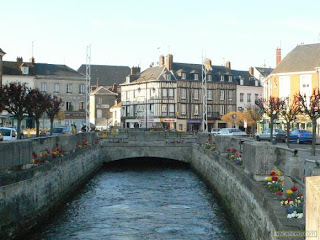 The area of Andelle, Bray and Lyons La Foret is definitely a pleasant area to spend a bit of time and stop at a country cafe. I was keen to make progress on my journey so pushed on further south towards Etrepagny. After Lyon La Foret, fortunately the road went downhill. Unfortunately, so did the scenery. La Neuve Grange and Etrepagny were grey dismal towns that complemented the non-descript, flat windswept landscape. This area was rather like Flanders but without the bergs or Trappist beers - just combine harvesters and municipal housing. I even passed through a place called Doudeauville, which I thought might be an inland version of that swanky Deauville place by the sea. But it wasn't - just ordinary folks hanging around the streets with not alot to do. I then headed on to Gisors, which, scenery-wise was the only saving grace on this section of the journey. Here, I had my afternoon snack before taking the road to Marines. This was another boring trek across flat roads. Also the traffic was a bit heavier now, with a few trucks and transit vans passing. I was looking forward to getting away from these unpicturesque plains of the Picardie region, and heading into the Parisien region. I could have taken the more picturesque lanes that followed the railway line, and then cut down through to Marines. However, I became impatient and eager to reach Paris sooner, so I took the faster D915 road. I soon regretted this as it was a soul destroying ride into a head wind, with lots of transit vans and trucks. Fortunately, most of these vehicles were travelling in the opposite direction. I suppose, with it being around 5pm commercial traffic was moving away from the city rather than going towards it. Also, with the higher density of traffic I figured that I must be on the edge of the Parisian region. Well, I was in Ile de France - the outer 'burbs of the Paris area. At this moment I turned down a road that took me due South - the D53. This was such a relief as suddenly the wind was no longer against me and I was no longer constrained to riding at 10 miles an hour ! Uh oh, I then hit a problem when, this road took me to a fast national road, which was banned to cyclists. How annoying was that. I was only about 25miles from Paris. I could smell it, I could even taste it, but I couldn't make the link to get there. What a heart-sink moment. A local club cyclist stopped to assist, and gave me directions on how to get across. It involved going back on my self to some small villages - Gouzangrez, Us, Ableiges, Montgeroult and then through to Pontoise. That meant I would then have had a really tedious couple of hours of riding a couple of miles, then studying the maps as I picked my way through the various suburbs - places like St Germain en Laye, Maisons Lafitte and La Defense. Ok, these places do look nice on sunny days like this, but it was around 6pm now and the sun was going in - I was getting a bit fed up of turning the pedals and I was just looking forward to putting my feet up in a Parisian Cafe - regardless of the fact that I my panniers and high visibility day-glo jacket were somewhat lacking in Parisian chic ! The guy, Patrice, was a friendly chap who was originally from Guadeloupe. He'd been out and done his regular 100km club run so was quite willing to twiddle his way back to Pontoise with me. I was feeling a little irritated and the idea of having to ride my heavy bike and panniers at even semi club run pace over rolling hills didn't sound that appealing. So I just politely thanked him for his offer and told him I'd be able to manage myself. My ride to Paris officially ended at Pontoise - about 20miles out from the Arc de Triomphe. The next time I do this ride (which I most certainly will do next summer) I will make sure I ride right through the Parisian Western suburbs as the limited exposure I had to these places gave me a flavour of how picturesque these areas are. The neighbourhoods were very green, with woods and rivers nearby. The architecture was old and had character. Alot of those houses had nicely painted fronts with window boxes full of fresh colourful flowers. The pavements were very neat and the folks walking down the streets were turned out in their Sunday best, even though it was only Thursday early evening - and of course some had the obligatory poodle ! This is definitely the area for the so called "BCBG" (bon chic, bon genre) - the French sloane rangers ! And of course, the rolling hills and green spaces also seemed to be a haunt for the club cyclist. I saw quite a few of them round here. All in various hues of sponsored kit, and all very polite in the way they acknowledged me. I caught the train into St Lazare station. 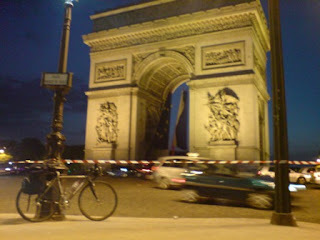 My next mission was to make the short ride across to Porte Maillot, where my friend Rachel lives. It was almost 8pm and it was beginning to get dark. There was a real bustle in the streets as people were either making their way home from work, or were on their way out for the evening. 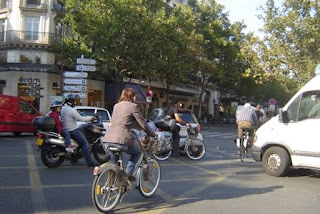 Coming out straight onto Boulevard Haussmann was a real baptism of fire, in terms of riding around Paris. I had to dodge round shoppers, tourists, and of course the numerous scooters, buses and taxis. Motorists don't really use indicators when driving around Paris. There seems to be no etiquette about which lane you travel in either. You might be in the left hand lane, but that doesn't mean you won't be turning right ! And as for junctions, you need to use all 7 senses ! I was just glad to be lit up brighter than a Christmas tree. Despite the chaos in the traffic, I was just glad to be there riding through central Paris. It was such a buzz. From Boulevard Haussmann, I made a left turn into rue de la Boetie. This was a long but narrow road (in contrast to the wide boulevard). There were lots of small boutiques, which got posher as I neared rue Faubourg St Honore and eventually Champs Elysees. There were lots of swanky black 4 x 4's pulling up and picking up beautiful or important people to go "Somewhere". The traffic on Champs Elysees was moving but it was cramped and there were zillions of traffic lights. So when we did eventually get the green light, there was a massive surge for 25 metres to the next set of traffic lights. As I had to accelerate with the motorists, it made for quite a bumpy ride as I rolled over the cobbles. I now have even greater admiration for the pro cyclists who speed up and down this road 10 times at the end of the Tour de France every year. Drivers on the Champs have a real knack of being able to fit their cars in spaces you wouldn't think a car would fit. But then again, they seem quite blase about scratches or dents on the car bodywork as well. At the top of Champs Elysees I stopped and photographed the majestic Arc de Triomphe in all it's glory, with the 12 avenues radiating out from it in all directions. Immediately, I was back on my bike, whizzing around this fairground of a roundabout, and down to Porte Maillot. 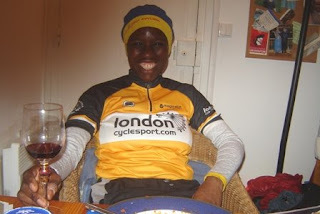 By half past 8 I was in Rachel's flat enjoying a celebratory meal with her and Yves. I'd had a great day out in the saddle. I had done just over 100miles in wall to wall sunshine. It had been beautiful all day. That was something I'd always wanted to do. Now I know it can be done quite easily, I imagine I will probably do this a few more times. Just done London to Paris via Dieppe. Slightly different route from you - see www.bobthebikeman.co.uk. I read somewhere that there are plans to make a permanent cycle way between the two cities in time for the 2012 Olympics. Seems that the Dieppe to Paris route has been picked because it's the shortest?